→ If you have the need to accommodate more people we can offer the entire villa made up of 3 beautiful apartments which share a swimming pool and a total of 5 secure garages. Do not hesitate to send us your request and we will be happy to organize the best stay for you in Cannes. "50 LEADER" is a unique holiday apartment that hosts up to 6 guests in 3 bedrooms with en-suite bathrooms, an open kitchen and huge living room offering a wonderful space to enjoy your holidays. 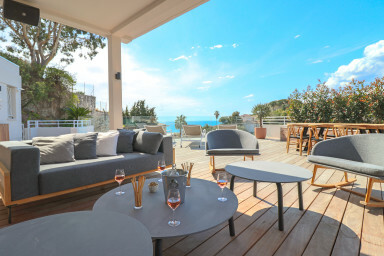 Perfectly located in front of the boulevard LEADER, in a quiet and accessible area of Cannes, you will be only 5 minutes away from the beach and 10 minutes away from the city center. This 140 sqm apartment was beautifully renovated and designed in 2019. Guests will enjoy a 250 sqm sun-soaked terrace, a shared pool with a large sun deck for tanning, a shower and sun beds for everyone. An interior gym is available if you don't feel like going for a run at the parc " La Croix Des Gardes" only a few hundred meters away. 3 bedrooms, 3 beautiful bathrooms, a modern and renovated kitchen with brand new appliances and Air-conditioning in each room. The gourmet kitchen includes , large induction cooktop, oven, refrigerator, dishwasher, microwave oven, pots and pans, cooking utensils, dishes, cutlery, and stemware. We provide everything needed to prepare a gourmet meal. Marché Forville : 5-, 11 Rue Marché Forville, 06400 Cannes. In the spirit of the French culture, a visit to Market Forville is certainly worth seeing. It is opened from 7 am in the morning until the middle of the afternoon every day except Monday when the antiques market takes its place. Try the burrata truffle (Italian soft cheese - Incredible!) the tapenade of olive (dough of olive with tomato and garlic) or the selection of fruits and fantastic vegetables. 1862 Wines and spirits : 5, rue du Maréchal Joffre 06400 Cannes. If you get the chance, enter and say hello to Hervé and Julian from my favorite wine cellar in town. Their recommendations are fantastic, their knowledge impressive , and they are really nice. Hervé worked as wine steward for Gordon Ramsay at Petrus in London . The oldest part of the port " Quay St Pierre ", welcomed the merchants from 1838. Now, it shelters the yachts of the rich and the celebrities. Make a walk up to the Museum of Castrates, to the Square Tower and in the church. From the top you can admire the view of the city, the port, the Croisette and the Lérins Islands. The sight of the Croisette at night, is also fantastic and a good way to stroll after a good meal. We also suggest that you leave the crowds and jump on the ferry towards the Ile de Saint Honorat. It is the smallest (and more attractive) of both "Lérins Islands" near Cannes and still shelters the monastery of 30 monks Cistercians. They produce an exceptional wine in the Abbeye de Lérins, what makes a fantastic present for friends and family because it is difficult to obtain outside the island. Make sure to ask "for saint Honorat" because ferries leave for both islands from the same terminal. Also verify the return hours and do not miss the last ferry. By foot, enjoy the many charms of Cannes : Its fine sand beaches, designer shops, bars and restaurants. In a 300m perimeter you will find : Supermarket, pharmacies, bakeries, and a multitude of different shops. This seaside resort is the meeting point of the French Riviera and the place of establishment of the very famous Film Festival. You will be 10 minutes away from the Palais des Festivals and the well known red carpet stairs.